I've been tearing my hair out the last couple days trying to get Windows installed. I have a MacBook Pro Retina 15 inch mid 2014. Yosemite version 10.10.1. Win 7 64 bit iso (sha1 - 0bcfc54019ea175b1ee51f6d2b207a3d14dd2b58). I have tried two usb 2.0 flash drives with 'Create a Windows 7 or later install disk' option in BCA. This proceeds smoothly and so does creating the partition using Install Windows 7 option. However, when it restarts, it says something along the lines of 'no bootable device' If I hold down 'alt', the only options are to boot back into OS X & the recovery disk. I realise this question has been asked countless times - I have read a lot of them but few seem applicable to my situation and those that are have not helped yet. I have not tried another USB yet since I am bandwidth limited (both in download speed and data limit) and BCA wants to redownload Windows support files every time and at this point it feels like a shot in the dark. Is there a way to determine whether the usb drives are at fault? Does BCA create the bootable drive in any special way? I.e. is it possible to create it by another method that will still play well with the bootcamp process? Special thanks to user Rafa, who was able to correct this procedure so it now works with Windows 10. Here I assume your computer is configured as required by the Boot Camp Assistant. (In other words, you will be installing Windows to the 4th partition on disk 0.) Also, your firmware is up to date and you have downloaded the correct "Boot Camp Support Software" for your model Mac computer. Before starting, remove all DVD's and external devices from your Mac. 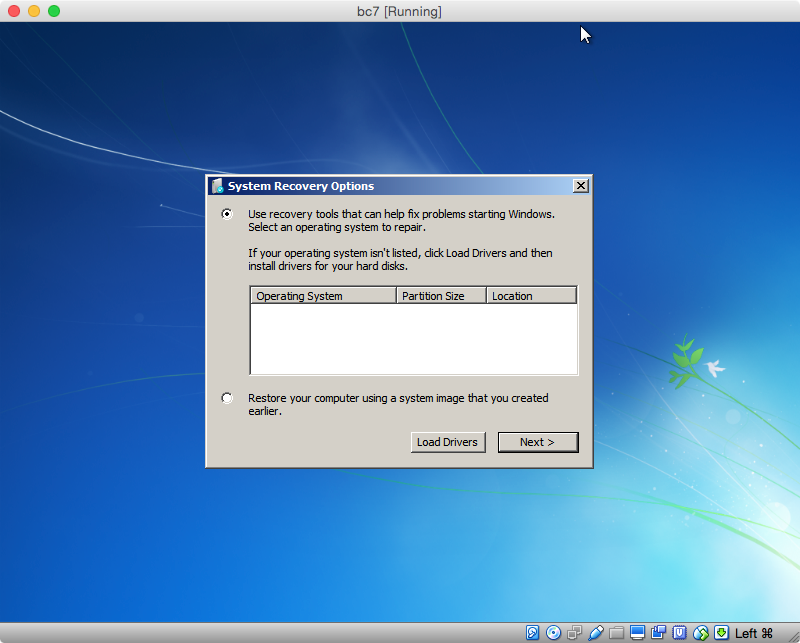 Note: Some of the steps, that do not involve VirtualBox, have images captured from a VirtualBox window. This was done when this was the easiest way to create an illustration. I suppose I could have cropped the images, but I chose not to. Create a MS-DOS (FAT) formatted partition on your Macs internal drive. This is where Windows 7 will be installed. You can use the Bootcamp Assistant, the Disk Utility, or commands (distutil, gpt and/or fdisk) entered in a Terminal window. Other third party tools, such as gdisk, can also be used. Give the label for this partition the name "BOOTCAMP". When finished, quit all applications. This procedure requires the "BOOTCAMP" partition be the 4th partition on your Macs internal drive (disk0). If you are using the Disk Utility from OS X 10.7 or newer and your Mac has the default drive configuration, then the new "BOOTCAMP" partition should be created as the 4th partition automatically. Download and install a free copy of VirtualBox. I used VirtualBox 5.0.14 r105127, Copyright © 2016. Do the following to transfer the "Boot Camp Support Software" to a partition compatible with VirtualBox. Create folder named "VirtualBox" in your Documents folder. Open the Disk Utility and from the menu bar select File->New->Blank Disk Image. Create this image in the "VirtualBox" folder using the following parameters. 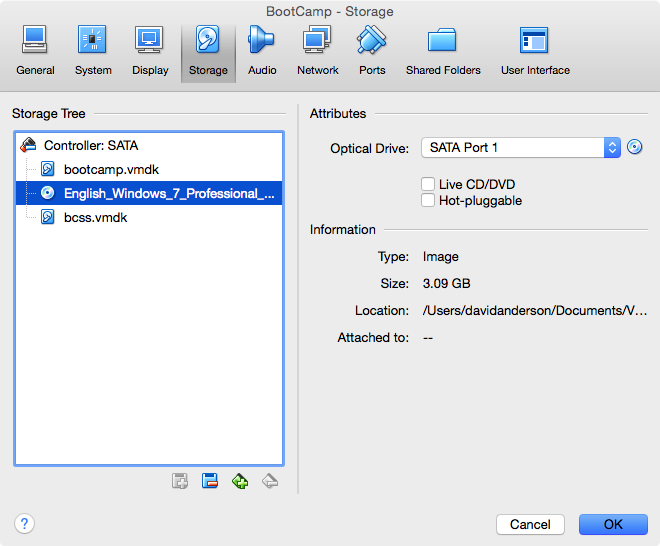 This step will create the file needed by VirtualBox to access the partition containing the "Boot Camp Support Software". In a Terminal application window, enter the following commands. Note: I assume you are using the default Bourne-Again Shell (bash). 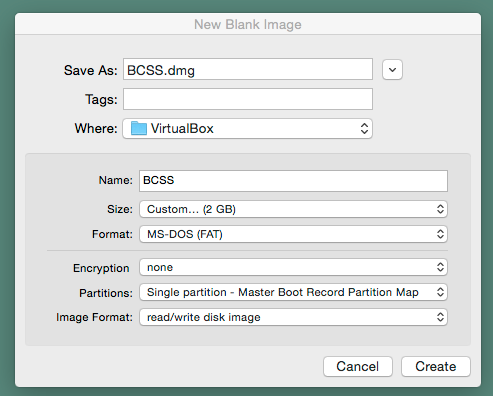 The result should be the creation of the file bcss.vmdk in your "VirtualBox" folder. Later, you will select this file to give a virtual machine access to this partition. Note: At this point, one should realize it would be easier to copy the commands from this document and paste them into the Terminal application window. This step will create the files needed by VirtualBox to access the physical partition where you will install Windows. In a Terminal application window, enter the following commands. Note: This access granted by the chmod command will only last until OS X is rebooted. 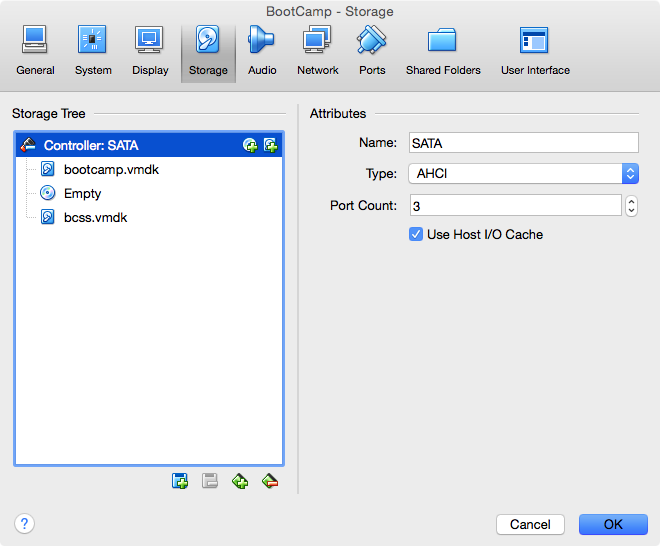 The result should be the creation of the files bootcamp.vmdk and bootcamp-pt.vmdk in your "VirtualBox" folder. 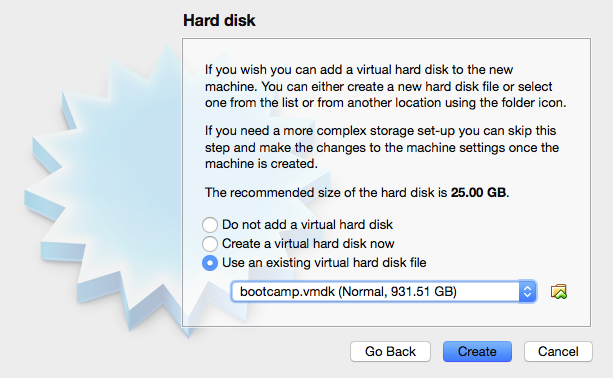 Later, you will select the file bootcamp.vmdk to give a virtual machine access to the physical partition. Note: OS X prefers to automount file systems. This can be disabled for a particular partition by creating or modifying the /etc/fstab file. Instead of employing the /etc/fstab file, the user is asked to repeatedly enter the following commands. These commands unmount the physical "BOOTCAMP" partition and the disk image file bcss.dmg containing the "BCSS" partition. Configure the virtual machine. Open the VirtualBox application and click on icon above the New label. Enter or select the values shown below, then click the "Continue" button. Use the default settings except for the hard drive. Choose the "Use an existing virtual hard drive file" button. Navigate to your "VirtualBox" folder. Highlight the bootcamp.vmdk file. Before clicking the "Open" button, enter the following commands in the same Terminal application window. Open the bootcamp.vmdk file. Your window should appear similar to what is shown below. After returning to the VirtualBox application's "Oracle VM VirtualBox Manager" window, click on the icon above the "Settings" label. Next, click on the icon above the "Storage" label. In the "Storage Tree", "Controller: SATA" should be highlighted. Right click on this highlighted area and select "Add Hard Disk". Choose the "Use an existing virtual hard drive file" button. Navigate to your "VirtualBox" folder. 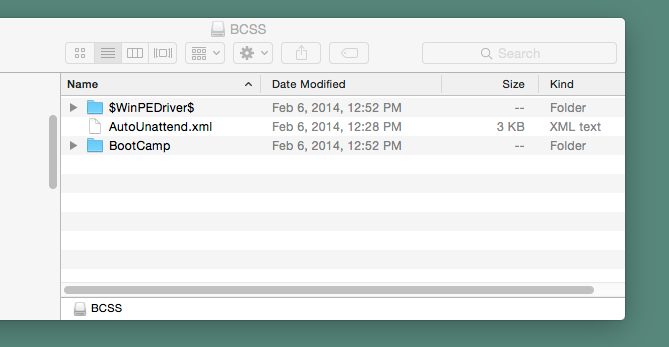 Highlight the bcss.vmdk file. Before clicking the "Open" button, enter the following commands in the same Terminal application window. Open the bcss.vmdk file. Next, select the "Use Host I/O Cache" option. Your window should appear similar to what is shown below. Click OK to close the window. Your "Oracle VM VirtualBox Manager" window should appear similar to what is shown below. In this step, you will copy the necessary files to the physical partition, so later you can restart your Mac and install Windows. Enter the following commands in the same Terminal application window. Next, click on the icon above the "Start" label to boot from the Windows 7 iso file. Press the space bar, if prompted to "Press any key to boot from CD or DVD." Note: The mouse pointer must be over the virtual machine screen window before you press the space bar. When the display below appears, click the "Next" button. When the display below appears, select "Repair your computer". With the button "Use recovery tools that can help fix problems starting Windows." selected, click the Next button. Select the "Command Prompt" option. Insure the drive letters C through F are not assigned by default to a volume by entering the following commands. Enter the following to determine a list of the current volumes. The image below displays the volumes found on my Mac. You may get different results. Enter the following commands, to assign the drive letters D, C and E to the CD-ROM volume and the volumes labeled "BOOTCAMP" and "BCSS", respectively. In the image shown above, these are volumes 0, 3 and 4. If your volume indices are different, make the appropriate substitutions. Also, NTFS format the "BOOTCAMP" volume. When finished, the volume letters should appear similar to what is shown below. Next, enter the commands givens below. The bootsect command writes boot code to a Volume Boot Record (VBR) of a partition and Master Boot Record (MBR) of the corresponding drive. The next sequence of commands creates a Virtual Hard Disk (VHD) file. 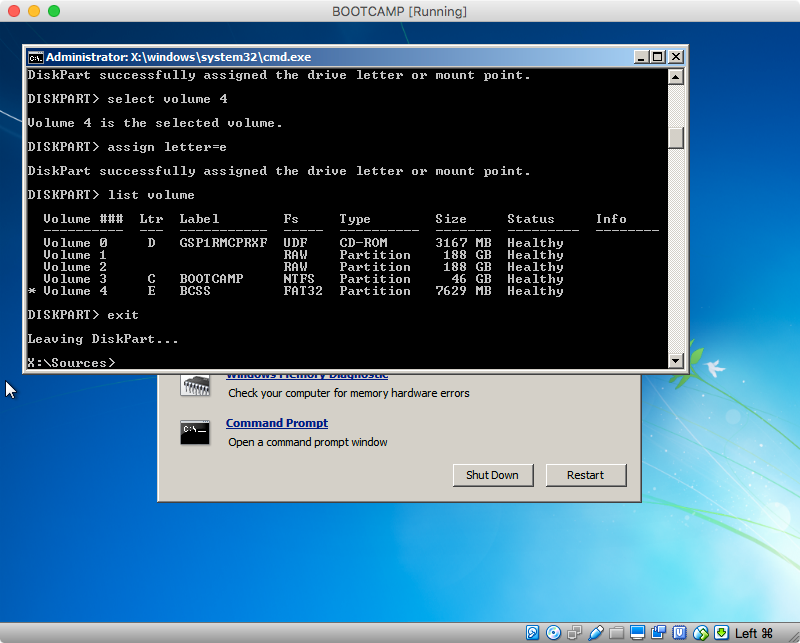 The VHD represents a virtual flash drive from which Windows will be installed on to the physical "BOOTCAMP" partition. Note: If you are installing Windows 10, then the parameter fs=fat32, in the format command shown below, should be replaced with fs=ntfs. Finally, copy the Windows installer iso and "Boot Camp Support Software" files first to VHD, then directly to the physical partition where Windows is to be installed. Exit the Command Prompt window when finished. Note: The files \sources\boot.wim and \sources\install.wim take a long time to copy. The file sizes are 168 MB and 2.95 GB, respectively. Select the "Shut Down" button to shutdown the virtual machine. Quit the VirtualBox application. This step will involve configuring Master Boot Record (MBR) of your physical internal drive. The MBR is stored on the first 512 bytes of this drive. This space is shared by boot code and the MBR partition table. This step can not be preformed under OS X 10.11 (El Capitan) with System Integrity Protection (SIP) turn on. (This is the default setting.) If you are using OS X 10.11, you must disable SIP, complete this step, then restore SIP. See the link: How do I disable System Integrity Protection (SIP) AKA “rootless” on OS X 10.11, El Capitan?. In a Terminal application window, enter the following commands. The first fdisk command flags the "BOOTCAMP" partition as the active partition. The second fdisk command changes the "BOOTCAMP" partition id to 7. 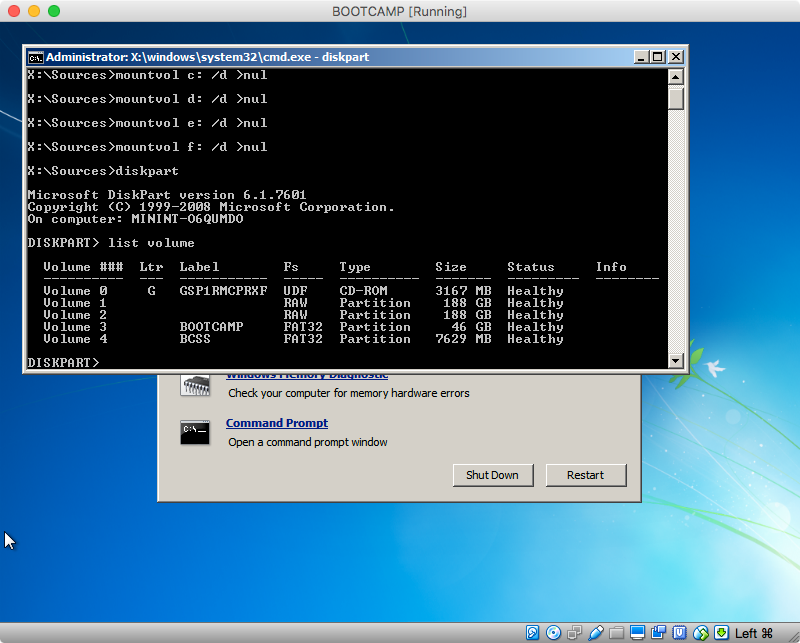 The final fdisk command copies the boot code from the MBR of the disk containing the "Boot Camp Support Software" partition to the MBR of the physical disk containing the "BOOTCAMP" partition. This is the step where you install Windows to your "BOOTCAMP" partition. Restart your Mac and hold down the option/alt key. Select the Windows icon to boot from the "BOOTCAMP" partition. Open a Command Prompt window, by navigating through the displays as you did in step 7. Enter the commands below to attach the "FLASHDRIVE" partition stored in the Virtual Hard Disk (VHD) file. On my Mac, the output from the list volume command shows E to be the drive letter assigned to the "FLASHDRIVE" partition. If your drive letter is different, make the correct substitution when entering the e:\setup command given at the end of this step. Next, remove all the files, but one, from the "BOOTCAMP" partition. If the above command executes correctly, you should get the error message: "c:\flashdrive.vhd - The process cannot access the file because it is being used by another process." 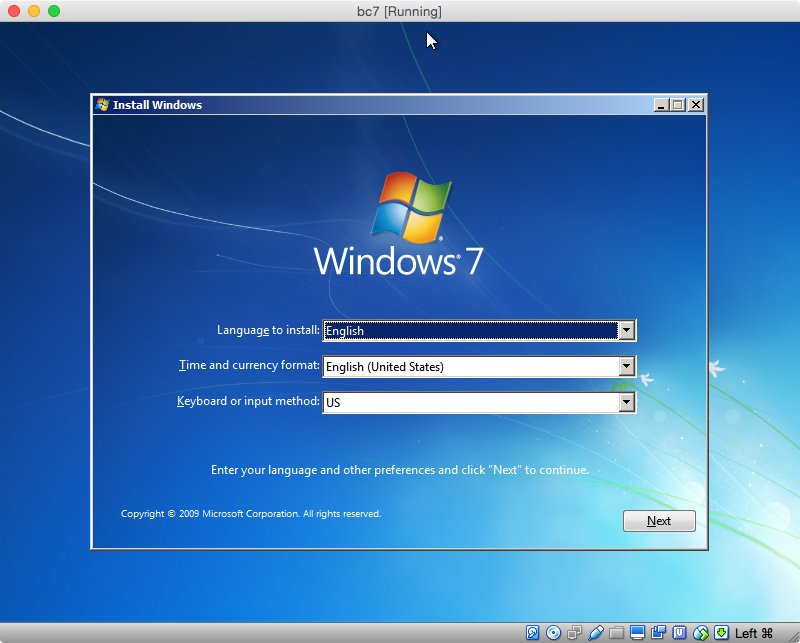 Start installing Windows 7 by entering the command given below. Select "BOOTCAMP" as your installation partition. The installation files are stored in the "FLASHDRIVE" partition. Since this partition is stored as a VHD file in the "BOOTCAMP" partition, do not try to reformat the "BOOTCAMP" partition. You will remove these installation files in a later step. When your Mac restarts, it will boot to OS X. This is to be expected. From the "System Preferences" select Windows as your startup disk and restart the Mac. Your Windows installation will continue. Once Windows finishes installing, the "Boot Camp Support Software" can be applied. To access this software, the c:\flashdrive.vhd file, containing the "FLASHDRIVE" partition, needs to be attached. Click on the "Start" button, type in diskmgmt.msc and hit the return key. Once in Disk Management, click on Action in the menu bar and select Attach VHD. Select the file location and check "Read-only" to prevent writes to the VHD file. After you hit "OK", the drive will show up in Disk Management with a blue icon. Close Disk Management. In the AutoPlay popup window, select "Open folder to view files." (If no popup appears, use the Windows Explorer to open the drive labeled "FLASHDRIVE".) The setup.exe file can be found in the folder labeled "BootCamp". Execute this application to install the "Boot Camp Support Software". 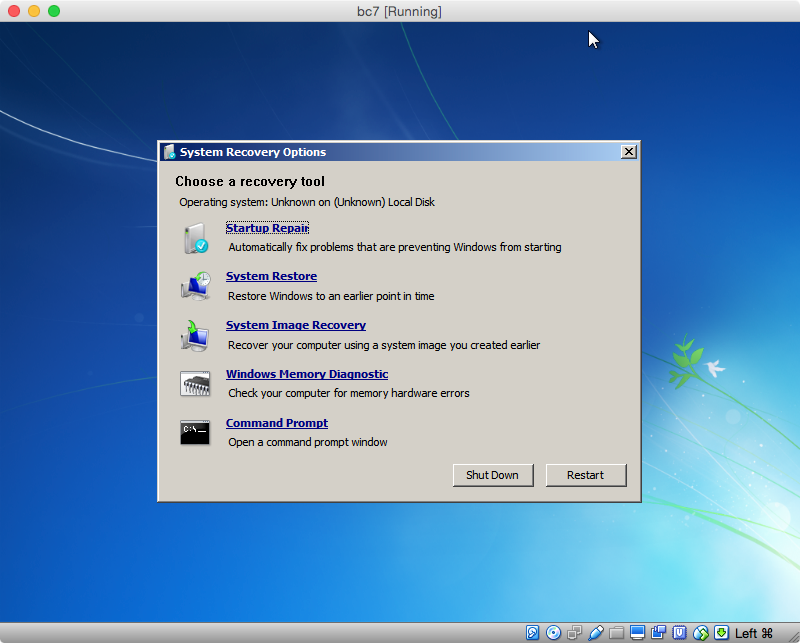 The VHD file will detach when the computer restarts. Finally, remove DVD and "Boot Camp Support Software" folders and files. This can be accomplished by dragging the c:\flashdrive.vhd file to the Recycle Bin. If you get an error message about the file being open, restart the computer and try again. The "Virtual Box" folder can be deleted. You will probably need to eject the "BCSS" partition first. 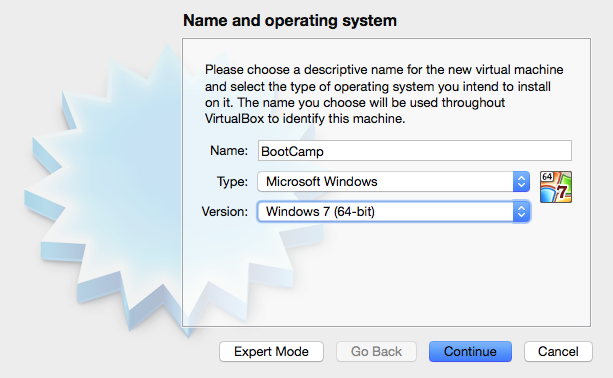 You can delete the "BootCamp" virtual machine. This can be done from the VirtualBox application. If VirtualBox does not remove all the files, you can remove them manually. Look in the ~/"VirtualBox VMs" folder. You can delete the Windows 7 iso file. You can remove the VirtualBox application, but since it takes such little space, I would not bother. I do not have a new enough Mac to install using a USB flash drive and I have not created one recently enough to remember what is stored on it. You can mount the iso file and I believe you should be able to compare with the content on the flash drive. But again I am not sure. Your external USB ports are both USB 3 and that might just be the problem. The Windows 7 installer may not work with USB 3 ports. Do you suppose Apple expects you to use an external optical (DVD) drive? 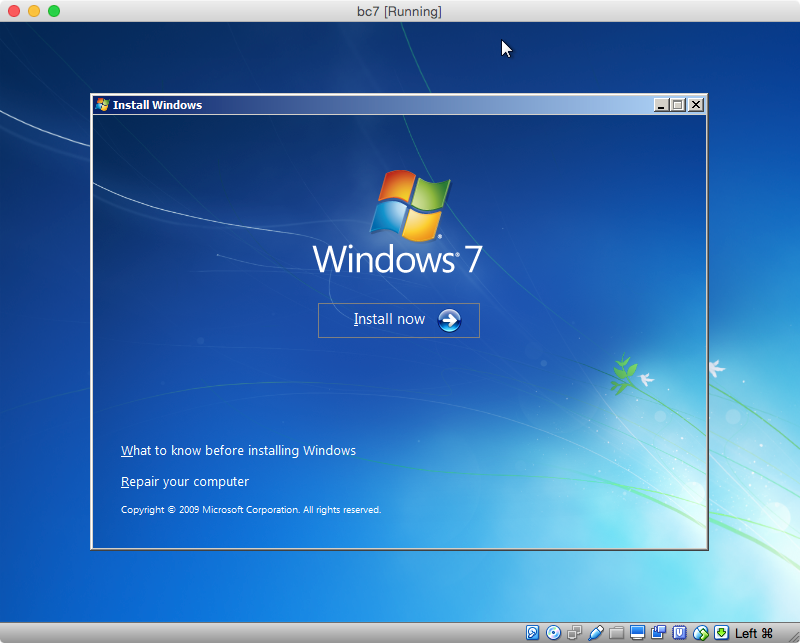 It is possible to install Windows 7 without the use of a USB flash drive or a optical DVD drive. The process is tedious and I will not go into the steps unless you are interested. You will need to download free third party software to do so. Did you download the "Boot Camp Support Software" and follow the steps outlined at the site given below? MacBook Air (mid 2012). Latest El Capitan 10.11.3. USB 2 flash drive (not USB 3). Download win10 64 bit installation ISO file from MS. Restart. Shows the "no bootable partition" message. Power down. Power back up, with Option key pressed. Only see "Macintosh HD" and "Recovery 10.11.3". Select "Macintosh HD". Restart. Hold the Option key when it starts to power up. Now it shows 4 choices on the boot screen: Macintosh HD, Recovery, USB (Windows), USB (EFI boot). Choose USB (Windows). Installation starts. Not the answer you're looking for? 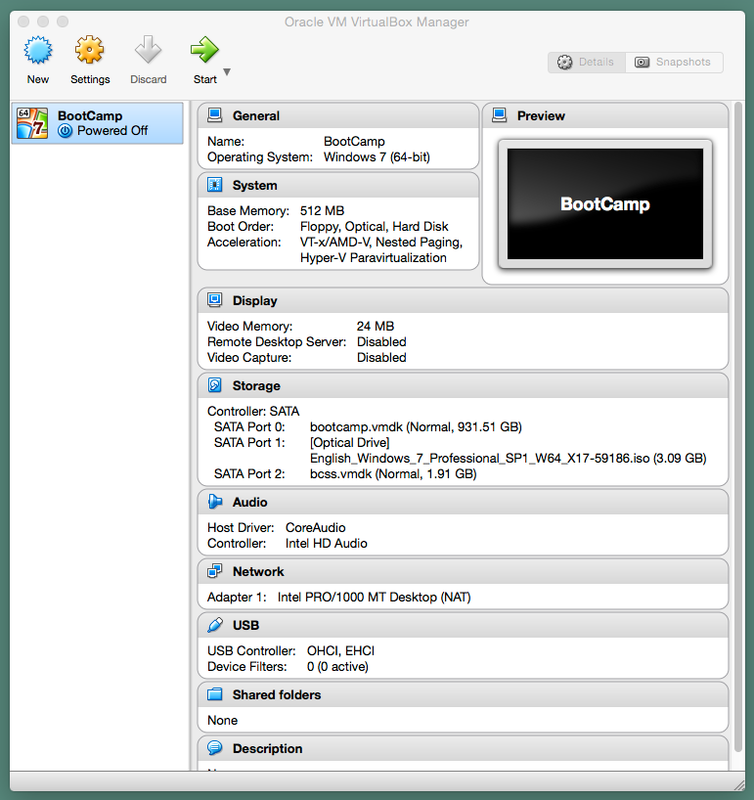 Browse other questions tagged bootcamp usb windows-7 dual-boot bootable-disk . Is it possible to Bootcamp Windows 8.1 using USB on Late 2011 MBP? Operating System Not Found from bootable USB?